Aaron Poling, owner of A.S.A.P. Garage Door Repair in Huntley, has been in the business ever since he was a young child. He’s now the fourth generation of Polings to lead the garage door business. Many things must be in place for a company to succeed. There must be a demand for your product or service. Customers must be satisfied with the value and quality of your offering. A well-trained team must be groomed to handle business growth efficiently. And the owner must have integrity, vision, a strong work ethic and the wisdom to adapt to changing circumstances. Such is the case for Aaron Poling, owner of A.S.A.P. Garage Door Repair, 11351 Allison Ct., Huntley, who began learning his craft at age 10 from his father, Harold Poling. Harold had learned the craft from his father, Bob Poling. Now 47, Poling oversees a 23-employee operation that’s expanding both locally and into a second state. He works with homeowners and contractors, but also sells products wholesale to roughly 60 other commercial companies. A.S.A.P. services residential and commercial garage doors, electric openers and industrial dock equipment, among other things, in a radius that encompasses downtown Chicago, its suburbs, Rockford and southern Wisconsin. The business has moved to larger properties five times, and currently has three commercial properties, including a 12,500-square-foot office and warehouse space in Huntley. Poling’s son Aaron will be the fourth generation of Polings to lead a garage door business when A.S.A.P. expands into Eagle River, Wis.
Poling’s grandfather, Bob, worked for a garage company in Chicago in the 1960s. 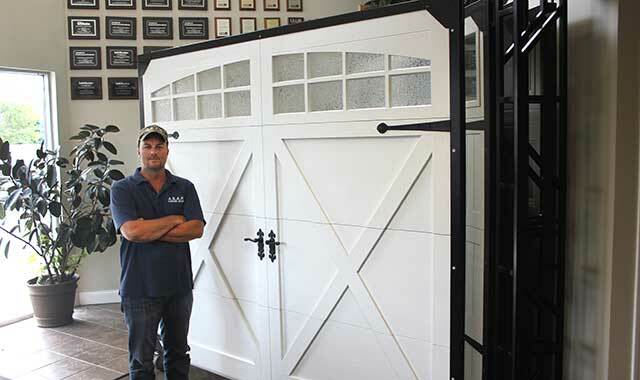 Bob’s son, Harold, started his own garage door company in the 1970s. In 1993, after many years spent working for his father, Aaron Poling decided to venture out on his own. While “As Soon As Possible” comes to mind, A.S.A.P. means something else to the Polings. It stands for Aaron, (wife) Shelly and (son) Aaron Poling. Shelly, Poling’s wife of 27 years, came up with the name. “In the 1990s, every business wanted to be at the front of the phone book. The name is original, easy to remember and something she came up with,” says Poling. While Poling learned his craft early on, from his father, he also learned a great deal about running a business through trial and error. Poling knew that, to be successful, a business must continue growing. The 2008 recession made this difficult, but Poling wasn’t about to give up. As other companies went out of business, he adapted to a new reality and changed his strategy. This is also when Poling decided to enter the wholesale side of the business. He expanded A.S.A.P.’s commercial service offerings and began working with national homebuilder William Ryan Homes. This created an additional revenue stream that kept the business going. As the business grew, Poling wisely stepped back and handed off responsibilities to other employees. He believes many small business owners fail because they refuse to delegate. Poling promotes his employees from within. In 2005, he had two employees. Today, one is the general manager and the other is the sales manager. To make sure each job is done correctly, new employees of A.S.A.P. must undergo an extensive training process. “It takes about one to two years to get all the basics down,” Poling says. Poling wants all of his employees to understand all aspects of the company and to realize what their long-term positions will be like. The company deals with the unexpected and must be able to address any situation. A.S.A.P. currently operates from Huntley and is likely to stay put. It’s the fifth location the business has had in its history. “We found a home in Huntley and we like it here,” Poling says. Poling is happy about the road he has chosen, for good reason. His company is doing well. This entry was posted on Monday, October 10th, 2016 at 11:57 am	and is filed under Northwest Business Magazine. You can follow any responses to this entry through the RSS 2.0 feed. Both comments and pings are currently closed.